In 2018, Montreal expects to host more than 60 cruise ships between May and October. Mariners' House welcomes 15,000 visitors each year, including many of the workers who staff these cruise ships. Working for 8-10 months at sea for 12 hours each day, our centre provides a welcome reprieve, offering physical, emotional and spiritual care. 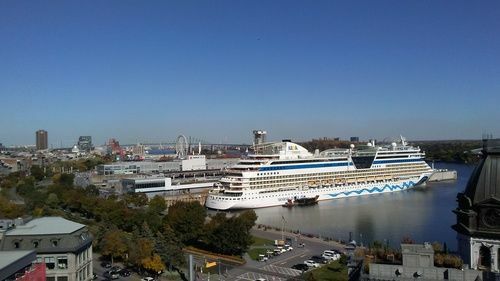 La Presse recently published a story on the cruise industry in Montreal and interviewed Carolyn Osborne, the MH General Manager. Read the full article here. How Do They Do It! M2S on the radio - CBC Interviews David!Meet the Newest Member of M2S StaffLook Ma - TWINS! Banner Celebrates with M2S 50 Years of Ministry. Our chaplain is a celebrity! In Memory of Karin BurghartHow Very Encouraging! The Ministry to Seafarers (M2S) of the Christian Reformed Church is an organization dedicated to reflecting Jesus' love by caring for the physical, emotional, and spiritual needs of seafarers visiting the Port of Montreal. M2S exists to be an advocate for all seafarers, and to provide a safe, relaxing place they can call their home-away-from-home.